A large part of the population of Bangladesh is poor. The poorest of these poor find themselves in a vicious circle, because they don’t have collateral to prime income-generating activities. Many attempts have been made to break this circle. The micro credit schemes, operated by several NGOs (non-governmental organizations) are a good example of such attempts. The main idea is to give people access to resources with which they can generate an income, with which they then can acquire more resources to generate more income. Instead of providing money or other means to acquire resources to generate income, another approach to the poverty-problem is to try to find a way to generate income with resources available to these poorest people. 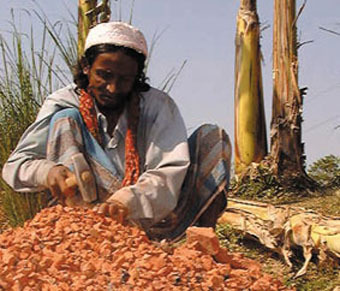 In Bangladesh, most poor people can work, have access to land on which their shack is built, what the area (or fields) around it can provide, and water. An income-generating activity making optimal use of these resources is homestead catfish culture, as was practised locally in the project area of the Compartmentalization Pilot Project (CPP) in the central region of Bangladesh. This practice was taken up by the CPP, and further refined into a homestead fish-culture programme. Requirements for this activity are; food for fish, a small pit, water, and catfish fry. The fish food can be collected from the surroundings of the homestead (snails, bivalves, termites, ants, slaughter waste, etc.). The pit does not have to be large, 1m2 is enough for 50 fry, so it can be dug by the participants themselves. Catfish fry is widely available in Bangladesh, for reasonable prices (between 10 to 50 Taka [= US$0.2 to US$1] (1US$ is equal to about 50 bangladesh Taka) for 50 pieces). 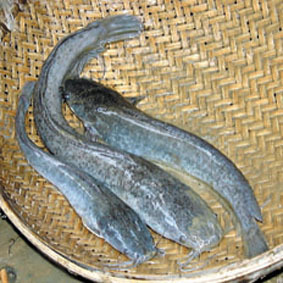 After a rearing period of four months the production will be five to six kg of African catfish, which is equal to approximately 400 Taka (=US$8). 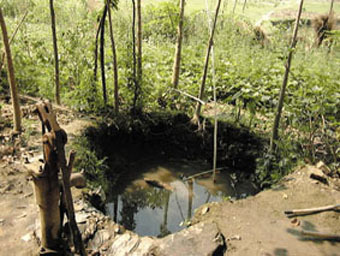 The basic concept of a homestead catfish culture programme is that the poorest people in an area are introduced to an easy method to culture fish in small holes or pits in the ground on the homestead. The African catfish (Clarias gariepinus) is used because this fish is known to take up oxygen from air, has a high growth rate, and is very disease resistant. Experience shows that as soon as people are introduced to this method, they adapt it to the possibilities around their homesteads. During and after successfully raising a first batch of fish, the people on and around the involved homesteads develop initiatives for continuation of the activity, such as contacting local fry traders and trying out different food sources locally available. In the programme, initiatives like these are stimulated and form the core of the success of it. All training of participants was done on site, at the homestead. Field staff worked with around 50 participants per staff member at a time. The first interaction between participants and field staff was during the identification of participants. To ensure selection of the poorest of the poor, a general review of the participants’ situation was made. To be selected for the programme the potential participants had to comply with few criteria. They had to be (a) landless (people owning less then 0.02 ha of land are considered landless in Bangladesh), (b) their general situation had to be poor/desperate, and (c) their house needed to have mud, bamboo or jute walls. If potential participants fitted all criteria they were asked about their interest in partaking in the programme, which involved them buying fry for a reduced price (10 Taka, 20 US cents) from the field officer. The price was reduced to facilitate cooperation between the field officers and the participants, so that it was possible to visit the participants at certain intervals, and ask questions about their experiences. The fish need to be fed every day, preferably until they do not want to eat anymore. The food can be anything, except grass and plastic. The best food being protein rich food. As soon as the water in the pit starts smelling bad it needs to be changed. During the change of water special attention needs to be paid to the sizes of the fish; these need to be in the same range, to prevent cannibalism. Two to three days after the sale of fry, the involved field officer paid the participant a visit. This proved to be crucial to the success or failure of the participating household; a number of participants not visited within these three days failed to rear their fish successfully. After the first two contacts, the household was visited every three to four weeks, to monitor progress and to answer any questions concerning fish culture in each pit. Two hundred households participated in the homestead catfish culture programme. The average size of these households was around five. Most male household members (84 percent) had an income-earning job with which they earned on average 49 Taka per day. On the other hand, most of the women in the selected households stayed on the homestead (90 percent) and were not earning money. The women who did earn an income brought home less then men, the average daily income for women was 15 Taka. A small number of children (2 percent) generated an income, on average 22 Taka per day per child. Sixty percent of the children went to school, primary school in most cases being the highest education of these children. On the whole the daily income per household was around 60 Taka. The participating household members had two to three meals per day, mainly consisting of rice and vegetables. Three times per week the vegetables included pulses (dhal), containing high levels of protein. Twice a week the meals were supplemented with fish, once every two weeks with meat, and once a month chicken was added to the meal. Eggs and milk were consumed less then three times per week. Women took care of most of the pits (80 percent), men (15 percent) and children (5 percent). Care for the fish consisted mainly of collection of fish-food. This food could be collected from around the homestead, because the catfish eats almost anything. Children from nearby assisted caretakers in the collection of food, because of the interaction children had with the fish while feeding. It turned out that feeding was like a fun game to them. The food supply costs can be considered zero, taking into account that mainly women and children (who do not earn any income) collected the food. The supplied food consisted mainly of snails (46 percent), rice (18 percent), wheat bran (9 percent), rice bran (9 percent), bivalves (5 percent), or slaughter waste (5 percent). In other cases termites, earthworms, wheat powder, cow dung, fish, bread and duckweed were used. On average the water in the pit was replaced every 10 to 12 days. The average time spent on the fish was one hour per day. The caretakers themselves took decisions concerning management of the pits and, more importantly, decided what happened with the fish produced. Insufficient guidance by the project staff (not visiting the household within three days after distribution of the fish, not visiting the household every three to four weeks). Not enough time spent on the management of the pit by the responsible person in the household (less then one hour per day). Escaping of fish (after flood, or heavy rain). Over a six-month period 158 new households took up this method of fish farming, without intervention of the regular programme, a diffusion ratio of 158/200 = 0.79. African catfish will grow when the temperature of water in which they are kept is higher then 200C. Therefore, for the programme to be successful, a minimum water temperature needs to be guaranteed. This can be done by either having a growth season during summer, or to ensure a supply of water with a minimum temperature of 200C. Some of the participants used to replace the water from their pit daily with tube-well water of 210C. One can describe the situation of the involved women (80 percent of the participants) as being extremely dependent on their husbands, or desperate if a husband is not present. Only a small number of women (10 percent) earned a meagre income (15.2 Tk/day, 30 US cents). The rest had to rely solely on what their husbands supplied them, or some income from the occasional job and barter trade. An example of one these occasional jobs is ‘biri’ stick production. Biri is the local cigarette, biri sticks are the paper holders of the tobacco. The sticks are produced on the homestead, resulting in an income of 2.5 Taka per thousand sticks. On average an adult can produce that amount in three hours. Which means the income from this activity is 0.75 Taka (= 0.015 US$) per hour. Catfish culture takes on average one hour per day, four months for the production of five kg of fish (400 Taka), meaning a return of 3.33 Taka per hour. Evidently the Homestead Fish Culture Programme has had an enormous impact on people in the above situation. Five kg of catfish (400 Tk, US$8) in four months are in terms of the developed world not much, but for participants they can mean the difference between food on the plate and nothing to eat at all. 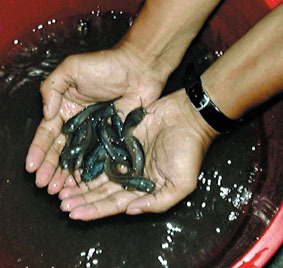 In the homestead fishculture programme the African catfish is being used, because of its earlier mentioned features. These features are unique to the African catfish. The main reason for the preference for the African catfish over the local catfish (Clarias batrachus) is its growth rate. The growth rate of the African catfish is much higher then that of its local relative. Some reservations about the use of this exotic species exist, because of the apparent possible dangers of the use of it. It is popularly believed in Bangladesh that the African catfish is a ferocious predator, capable even of eating small goats. The fear exists therefor that the African catfish will wipe out local fish populations. However, during the approximately 20 years the African catfish is being used in South Asia (and 15 years in Bangladesh), no scientific reports are made concerning possible negative impacts the species might have. Also during the implementation of the homestead fish-culture programme in Bangladesh no evidence was found concerning the ferociousness of this fish, on the contrary, it was perceived as a lazy omnivore, eating whatever comes in front of its mouth. At present there is a thriving industry in Jessore (southwest Bangladesh) where millions of catfish fry are produced per month. This industry produces for (illegal) export to India, and for the local market. Fry traders all over the country sell the African catfish. Up till now the demand for catfish fry within the project area was low, so the market for these fry traders was of no importance. However, now, with the homestead fish culture programme running, demand is rising and fry traders are moving in to sell their fish. 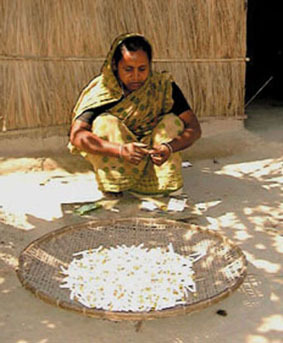 The traders distribute also to homesteads directly, making it possible for women to buy fry at their homesteads. The sustainability of the programme depends completely on the availability of fry of the species involved. As long as the fry is available the programme has an opportunity to be successful. Species used must be accepted by participants and the market. To make sure the African catfish does not become an environmental disaster, research has to be done concerning the ferociousness of the species, before a large-scale programme is set up to spread this method regionally and inter-regionally. Because participants will use the common resources around their homestead, an impact assessment has to be made on the effect of homestead fish culture on the environment surrounding the homestead. Although it was not an objective, the programme turned out to have a contribution to the improvement of the situation of women. It seems that it can be a useful tool in projects dealing with gender issues. The described method turned out to be a highly successful way to reach the poorest segment in the project area concerned. The participants turned out to be highly motivated and very innovative. If the potentially negative aspects of the method after proper research show not to be negative this method should be propagated nationally in Bangladesh, and beyond the Bangladeshi borders. FAO promotes, through their regular aquaculture programme, the integration of aquaculture into rural livelihoods. The described programme is an excellent example of this integration, with as an additional benefit the mobilization of a group of people which is very difficult to reach with ‘normal’ aquaculture programmes. The ‘ownership’, the possibility to make decisions concerning the application of the method, lies completely with the participants of the programme, giving them responsibility, resulting in a successful application of aquaculture by people from the poorest segment of society. All these factors make for a succesfull grass-root programme which could be followed in any rural development programme. Editors.